Sutherland Forsyth, the recently appointed Community Engagement Coordinator for the Botanic Cottage, will be working at RBGE for the next three years. He has written this update for the Friends:‘There will have been moments when the prospect of the Botanic Cottage being saved – let alone rebuilt – will have seemed like a distant prospect, a dream which might never become reality, scuppered by ‘life’ getting in its way. 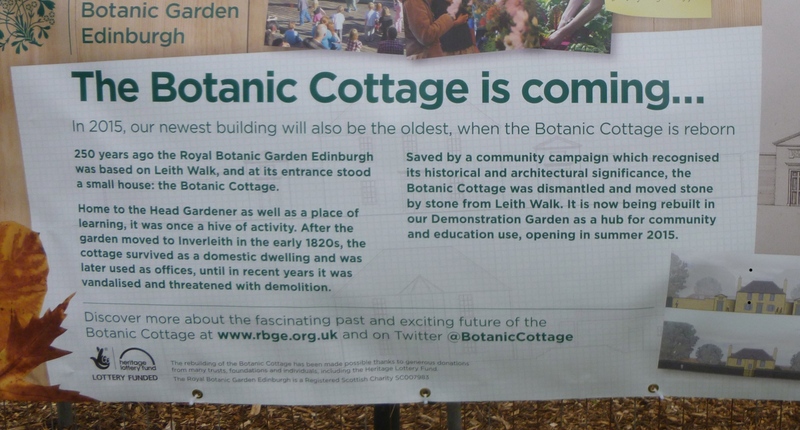 However, today we stand just weeks away from ground being broken and the Botanic Cottage rising like a phoenix from the ashes in its new home in the Botanics Demonstration Garden. We’re well on the way to reaching our fund raising goal, with £1.3m now pledged, including a large contribution from the Heritage Lottery Fund.Later this Spring not only will building work have begun, but public and community engagement programming connected with the cottage will have started, and all going well, a dig of the old cottage site on Leith Walk will have helped us to understand even more about the history of this unique building. I’ve already met some of the Friends of Hopetoun Crescent Garden and I hope to meet many more in the future – your role in saving the cottage means that you will always be an important part of its story, and as the keepers of the last surviving part of John Hope’s Leith Walk garden, you are helping to preserve a living link with RBGE’s past.Over the next few months there will be a range of activity connected with Botanic Cottage taking place, some of which I hope you will be able to be involved with. The community archaeological dig of the Leith Walk site (date to be confirmed – but likely to be in late March/early April) will give people the chance to get ‘hands on’ with history – if you are at all interested in having a go at being an archaeologist, or with helping us with this event, please do let me know and I can give more information. s.forsyth@rbge.ac.uk Do also look out for the little shed which will be appearing later this Spring in the Demonstration Garden at RBGE, in which you will hear a sounds-cape featuring some familiar voices talking about Botanic Cottage, as well as information about the project to rebuild it. The Royal Botanic Garden Edinburgh (RBGE) is delighted to announce the appointment of Simon Milne MBE as its new Regius Keeper. Simon will succeed Professor Stephen Blackmore following his retiral later this month and will become only the 16th person to hold the post since it was created in 1699. Sir Muir Russell, Chair of RBGE Board of Trustees paid tribute to the new appointee: “I am delighted to have someone of Simon’s calibre joining us to continue the excellent work done by Steve Blackmore. Simon is familiar with many of the issues facing us, particularly our hot topics of conservation and biodiversity.” For the last ten years Simon has been CEO at the Scottish Wildlife Trust, based in Edinburgh, and for four years before that he was Director of the Sir Harold Hillier Gardens in Hampshire .Simon Milne said he was thrilled to be offered the opportunity to take up such a prestigious and important role, adding: “The role of Regius Keeper at the Royal Botanic Garden Edinburgh offers me an opportunity to return to the remarkable world of plants. I am looking forward with relish to new challenges and the opportunity to play a crucial role in developing appreciation, education, knowledge and conservation of the plant kingdom.” The new Regius Keeper will take up his post in February.